2015 has been a big year for centennial anniversaries; 100th of Gallipoli, 200th of Waterloo and the 600th of Agincourt among others. Yet one of the most significant for the history of the Gunners has been largely overlooked. 12-13th November were the 300th anniversaries of two battles at Preston (12-Nov 1715) in Lancashire and Sherrifmuir in Scotland (13 Nov 1715) that decided the fate of the 1715 Jacobite Rebellion. On the death of Queen Anne in 1714 the crown of Great Britain passed to her second cousin George Elector of Hannover, a protestant rather than to her half-brother James, a catholic, exiled in France. On 8th September John Erskine, Earl of Mar raised the standard at Braemar in the name of King James VIII of Scotland and III of England. By 22nd October his army of nearly 20,000 men had captured most of Scotland North of the Firth of Forth. Mar was indecisive and lacked any experience of campaigning. He hesitated and gave the Hanoverians under John Campbell 2nd Duke of Argyll time to increase the strength of his forces. 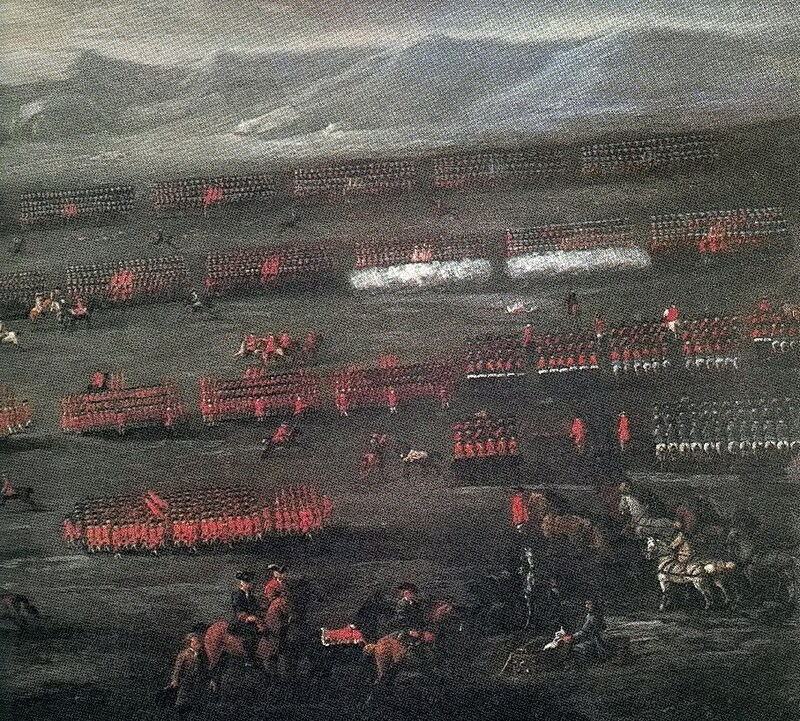 The armies met at Sherrifmuir North East of Stirling on the 13th November 1715. Despite Mar outnumbering Argyll by perhaps as much as three to one the battle was inconclusive. Meanwhile, in England Jacobite supporters in the West of England and Northumberland prepared to rise for the House of Stuart, led by three peers and six MPs. 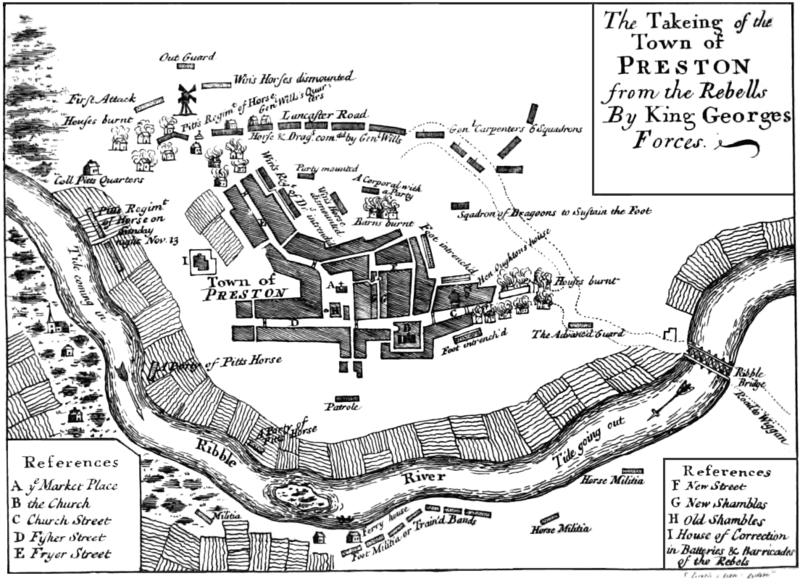 The government arrested the leaders and deployed troops to Bristol Plymouth and Southampton to prevent these ports falling into Jacobite hands. The rising ion Northumberland did take place, supported by several peers, and joining forces with a force of Scottish Jacobites from the Borders moved into Lancashire, where they hoped to find support. Government troops caught up with this force in Lancashire and attacked them around the town of Preston on 12th November, with the main attack along Fishergate. 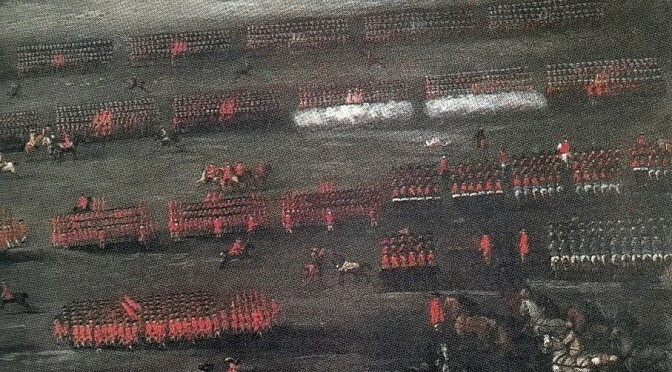 The Jacobites had the best of the first day, inflicting heavy losses on the government troops, in what is probably the last battle in England. 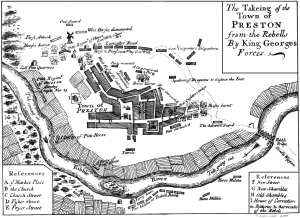 However, after reinforcements arrived, the majority of the Jacobite army surrendered. Artillery did not play a significant role in either battle. At the time, there was no peacetime artillery organisation, and an artillery train was organised for each campaign from the gunners in the Tower. It took so long to find men to man the artillery train that the rebellion was over before the train was ready to march. This was a dangerous weakness and the Duke of Marlborough, obtained a Royal Warrant to form a permanent regiment. Accordingly, the Royal Regiment of Artillery was created in 1716. Both battlefields are accessible. Sherrifmuir is still moorland. Although Preston has grown and sprawled over the centuries, the road layout remains the same. If you want to visit either, contact us.